Artwork - it's great. Do you know where it is from? oops sorry! Missed the S. Thank you for correcting my typo! Coffee table - Love the coffee table where is it from? This was custom made for Karen Aston Design. Hello, this lamp is from TRVM lighting, called the Vanni floor lamp. I cant recall if this company retails their products or is trade only. http://www.trvm.com.au/ The coffee table is from Globe West, called the Tripod table in natural oak. Regards, Karen. Love the rug. - The rug is beautiful. I am in Melbourne. Any suggestions where to find something similar? I have grey couches and have inherited a sage green Featherstone so need to revamp with new rug and cushions. Any ideas? Hi, the rug is from De Poortere in Waterloo in Sydney. http://www.depoortere.com.au/rugs/vintage-multi They have many different colour ways. I would contact them to see who they supply to in Melbourne. Hi, this vintage style patchwork rug is from De Poortere in Waterloo, Sydney. It comes in many different and beautiful colourways. Love the sofa! Where is it from? Hello, the sofa was custom made for the space by Kare Aston Design. However you may find a similar style from Jardan. The fabric is from Warwick Fabrics, called Chai. Tip: If you’re artistically inclined, why not try your hand at creating your own artwork? 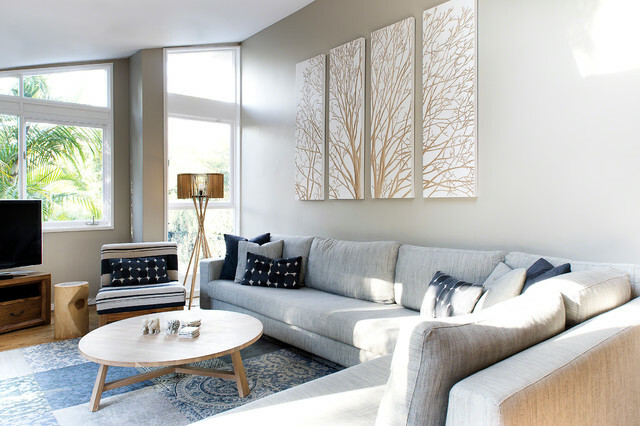 Spreading the design across several canvases will help you to avoid feeling overwhelmed by one enormous piece – they can also be separated slightly to fill an even larger surface space.